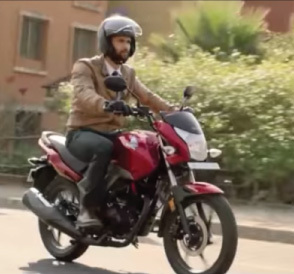 A scene captured from Honda Unicorn 160cc TV commercial. The target group for Honda CB Unicorn 160 is the new generation consumers who want to upgrade their existing 150-160cc motorcycle with an age group range of 25-35 years, married or unmarried individuals, residing in metro cities and towns. The Audience level typically comprise of students, company employees and businessmen. After a thorough market research the creative team curated an appropriate positioning. The CB Unicorn 160cc is meant for individuals who are sincerely pursuing a sense of ‘stability’ in life with no compromise. The creative agency behind Unicorn TV commercial is Dentsu Marcom. The campaign has been carried out through various channels like TVC, print, outdoor, digital and Cinema. Also check out Honda Unicorn’s LooksGoodIsGood campaign on Internet.